When I was pregnant, I remember my cousin asking me if I was going to cloth diaper. To which I quickly replied "NO WAY!" One day at Babies R Us, I was looking at the disposable diapers trying to figure out which ones to buy for Bennett which at the time I was still pregnant. My mom spotted gDiapers and she instantly fell in love, I came home and researched it and I fell in love as well! They have got to be the trimmest cloth diaper there is, and the money I save each month is wonderful! You can purchase gDiapers from a number of different places...Babies R Us, Buy Buy Baby, Target online, Amazon, and gDiapers.com. I have only purchased the inserts and some pouches from Amazon, the rest I purchased on a Facebook gDiaper resell group. To get started you need about 6-8 gPants (you only change these if they get soiled or after say 3 changes...I usually use 2 a day.) 24 gCloths (about 4 packs) or you can buy disposable inserts. 12 gPants pouch (2 boxes). 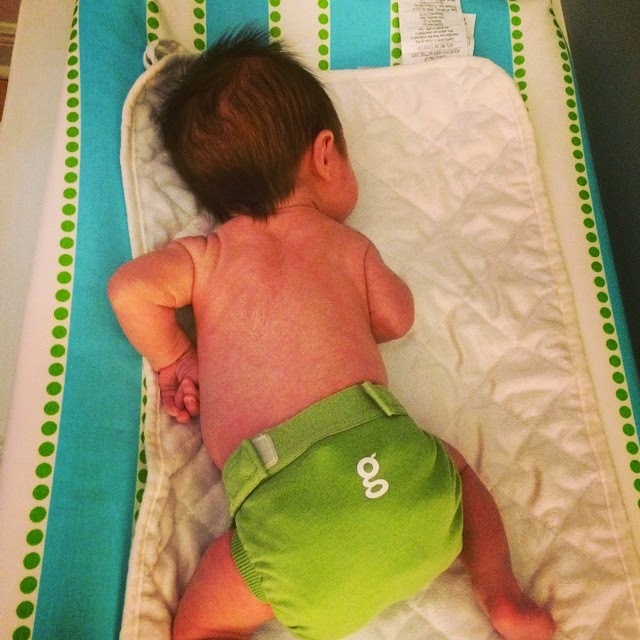 I never did buy newborn sizes, we ended up using newborn disposables and started the gDiapers at one month. He was in the small for a short period of time, maybe 2 months (?). The good thing about the M/L/XL sizes is that the pouch and cloth size does not change. So that means from 13 lbs to 34 lbs the only thing you buy is gPants. Here is my set up...I have disposables in the back for when someone babysits and doesn't want to use the cloth or at night. I put together my gDiapers so all I have to do is put a cloth in them and change like a regular diaper, instead of snapping in liners and cloth while trying to change Bennett. The pouch snaps into the gPant..
Then the gCloth goes soft side up into the pouch, or if you are using a disposable insert place that in there instead! You then put it on baby with the g on the bum. When the diaper becomes soiled, just take the cloth out and put in a wet bag (mine is in the diaper pail on the left) I then throw any wipes I use into the diaper pail on the right (which is by far my favorite as it uses regular trash bags!) as well as any liners or disposable diapers. If it's #2 and it's NOT EBF drop it in the toilet and either spray or wipe down so it doesn't stain your cloth or you can use liner (I used liners when we were in between EBF and solids). If it is EBF you can throw in wet bag as is. I still would have loved to have done cloth. Shaun just wasn't having it. Do the math and see how much you've saved so I can show it to him and prove what a better deal it is! Ha! If we have a second baby, I'm winning this battle!